Harry Accornero (R-Laconia) sent an email to every New Hampshire state representative stating that President Obama "has crossed the line, and under Article III section 3 of our Constitution is guilty of treason by giving aid and comfort to the enemy and attempting to overthrow our government from within." "I am formally asking you to bring a commission of treason against Mr. Barack Husain [sic] Obama," wrote Accornero in the email, posted by Blue Hampshire and obtained by The Huffington Post. "We have a President who allows our borders to be violated by illegals of any country while we are at war. He allows them work permits, access to our services and when apprehended by law enforcement refuses to have them jailed or deported." Accornero is not alone in criticizing the president on immigration issues - pretty much every Republican has something to say about the matter. The Obama administration set a new record for deportations, removing nearly 400,000 undocumented immigrants in the last fiscal year, Immigration and Customs Enforcement announced on Tuesday. The agency removed 396,906 undocumented immigrants from the United States in the 2011 fiscal year, a slight increase from the previous year's 392,826 removals. Administration officials said the increase is the result of a continued focus on policing undocumented immigration, a rebuttal to claims by GOP presidential candidates and others who say the president has been too soft on unauthorized immigration. It appears that the Obama administration is doing a far better job than the Bush administration in regards to the deportation of illegal immigrants. "Smart and effective immigration enforcement relies on setting priorities for removal and executing on those priorities," ICE Director John Morton said in a statement. "These year-end totals indicate that we are making progress, with more convicted criminals, recent border crossers, egregious immigration law violators and immigration fugitives being removed from the country than ever before." So far, the administration seems likely to continue to push for nearly 400,000 deportations per year, which enforcement officials say is the most they can remove under current funding levels. If Congress wants to see more deportations, Morton and Napolitano have said it should increase funding to Immigration and Customs Enforcement. 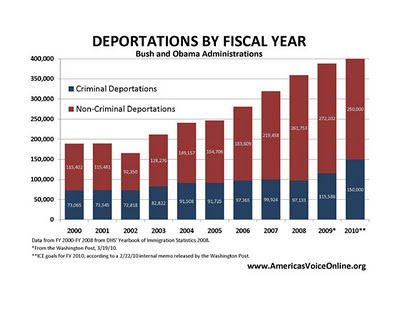 Napolitano said in August, "Congress should look at numbers if they want more deportations." Maybe Accornero should introduce an immigration bill that increases funding for ICE, or would that go against the GOP's mission to make the Obama administration a failing administration?